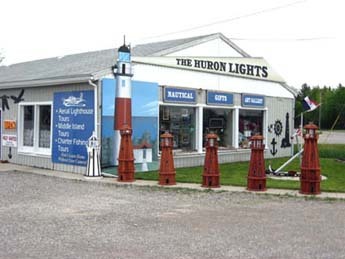 In June 2008, Lighthouse author Jerry Roach became one of the new owners of the Huron Lights Museum and Gift Shop. Now you have a one-stop shop for all your lighthouse news and information. Travel back in time to the days where light keepers and life stations were a way of life. Stroll the grounds and enjoy numerous displays of life boats, fog bells, buoys of all kinds, anchors, photos, hands on displays and historical artifacts. BUSES ARE WELCOME! Starting in 2009 we will be able to handle buses and large groups. Please call ahead for groups over ten. Open 7-days a week from 10am to 7pm from May through Christmas Eve.